This information is for students who are receiving their A-level results, IB results, Scottish Highers or results for other equivalent qualifications this year. Further guidance is available from UCAS. If your results meet all the conditions of your offer, your place is assured and you will be able to see confirmation of your place on UCAS Track a few days later. Congratulations! Your college will be in touch shortly after this but in the meantime you can share your good news and join the celebrations on Twitter at #GoingtoOxford. You might also like to read our information for new students. An open offer is the same as any other offer, except that your college has not yet been confirmed. An open offer is always underwritten by one particular college: the college which told you about the offer. Once you have received your results, please check UCAS Track. If you have met the conditions of your offer, the first status update you should check for on UCAS Track is UF (unconditional firm). This means your place has been confirmed at Oxford. Congratulations! If UCAS Track still shows your underwriting college, then this college is offering your place and you should follow the process set out by UCAS to accept this. If UCAS Track shows a different college from the underwriting one, that usually means that it is this college which is now offering your place. The change in college shows up as a change on UCAS track and you will need to accept this. Oxford University does not participate in UCAS Clearing, Extra or Adjustment. There are no further places available at Oxford University for any courses starting this year. We routinely make more offers than there are places available, to ensure that all places are filled. Further information about places available at other institutions can be found on the UCAS website at www.ucas.com. If you achieve top grades at A-level, or other equivalent academic qualifications which meet our admission requirements, you are welcome to apply for entry next year. More information on how to apply can be found at www.ox.ac.uk/apply but please note the deadline for applications for entry next year is 15 October. This is earlier than at most other universities. Please also remember that competition for places at Oxford is intense and even excellent results will unfortunately not guarantee you a place. If you are holding an offer from another university, you may wish instead to pursue your studies there. 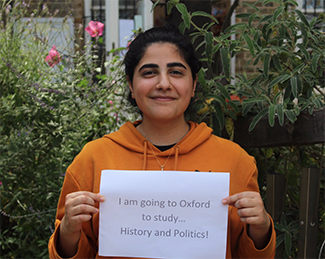 Share your good news and celebrate with us on Twitter by using the #GoingtoOxford tag.